The average American adult carries somewhere between 6 and 10 credit and store cards. That’s a lot to keep track of, especially when you’re trying to cram all of them into your wallet and that wallet gets embarrassingly bulky. 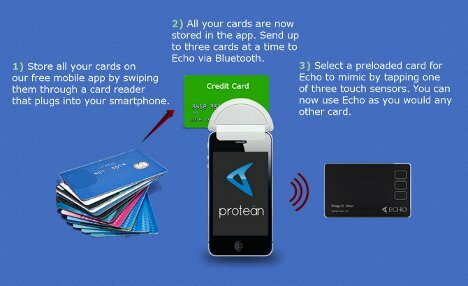 That fancy-looking card up at the top of this post is called the Protean Echo, and it’s meant to ease the load on your pocket by storing your credit card info and working in combination with your mobile phone. 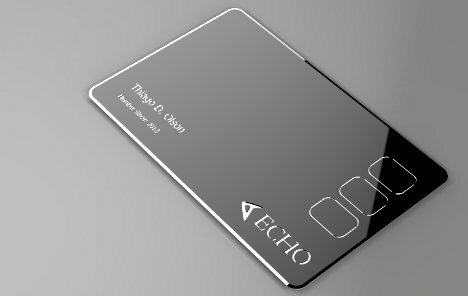 The Echo comes with a special smartphone dongle that lets you scan your credit cards’ magnetic stripes. The associated app can store as many cards as you have, but you have to choose three to “load” onto the physical Echo card at any one time (they can be changed whenever you like). When you want to pay for a purchase, you push the button on the front of the card representing the card you want to use and then swipe it. The dynamic magnetic stripe gives up your payment info just as if it were the original card. The Echo’s batteries last around two years and the card never needs to be charged. It is easy to imagine some retailers getting all bent out of shape about people trying to use the Echo for payment since it looks rather like a tool a thief would use to make use of stolen credit card info. But it’s a rad idea that we’d like to see gain acceptance among retailers.